Whether you want Drive-in, boat-in or fly-in these Atikokan lodges and their outposts have you covered! You Know Where You Want to Go - Now What? It can be overwhelming choosing between such an inordinate amount of lodges in such a large region. But if you clicked on this article, chances are you've narrowed it down to the Atikokan area which means you're halfway there! We have good news. There are eight spectacular lodges in the Atikokan region. Each as beautiful and appealing as the next. We're going to give you a small rundown of each lodge so you can decide for yourself which one works best for your needs, preferences, and fishing trip desires! Odds are if you've googled Atikokan region you've come across this image of Brown's Clearwater West Lodge's white sand, turquoise waters beach. We know it's beautiful, but it's definitely not their only qualifying feature to focus on when choosing accommodations. Brown's Clearwater West Lodge is also open year round, servicing guests all four seasons, which comes in handy when they are right across from the wilderness park of Turtle River White Otter. With nine outposts that can be reached by fly-in, boat-in and some that require portaging, you have the option to embark further into the wilderness if you so choose. 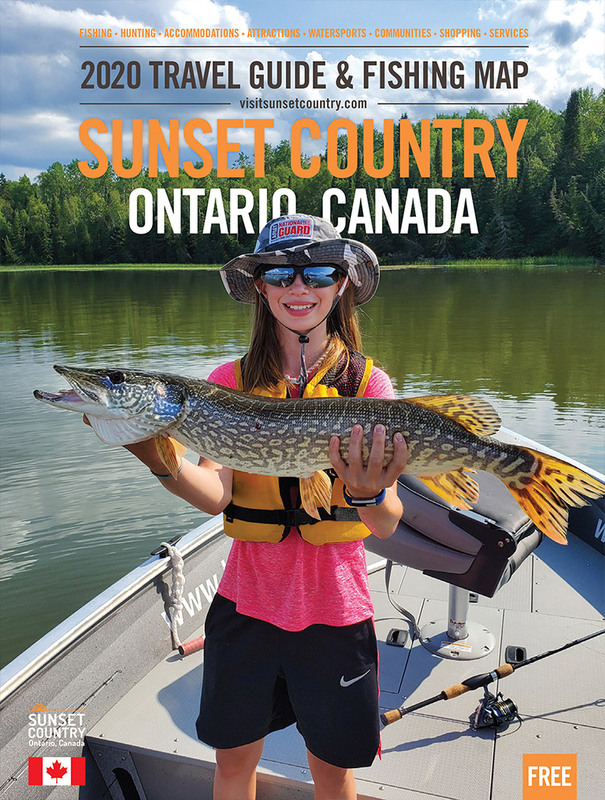 Well known for lake trout, this region doesn't disappoint, and if you check out Brown's Clearwater West Lodge's website out, this may be the deciding factor that brings you here! Camp Quetico offers modern drive-in accommodations and dining experiences! At Camp Quetico, all of the cabins have a spectacular view of Eva Lake. You can choose between their popular American Plan or set your own pace with a housekeeping package. This is great news for those who maybe don’t want to eat quite so early in the morning. Their cabins feature modern amenities such as four-piece bathrooms and even air conditioning, which contrary to during our winter, comes quite handy in the summer! Not unlike most places in the region, Camp Quetico has access to 40 of the outlying lakes in its vicinity. Keeping 105 boats all around give their guests the chance to fish as much water as humanly possible during their visit. When you aren’t fishing, be sure to take advantage of all of the main lodge's amenities, including but not limited to; pool table, eight-person gazebo with hot tub, laundry room, dining, store, and beach! Nestled on the shores of Lac La Croix, Campbell’s offers the type of remoteness you find yourself craving with most drive-in lodges. Each cabin is surrounded by mature pine trees giving each guest privacy and comfort. Campbell’s Cabins can host a few people or large parties. If you come in an extraordinarily large group, you can consider the option of the boatel. Each unit in the boatel has it’s own bathroom, heat, and fridges. Perfect accommodations to host a large group while keeping you all nearby. Campbell’s Cabins offers a variety of fishing and lodging packages, even including specials for couples who’d like to enjoy one another’s company while fishing. The only resort on Calm Lake! Spoil yourself with walleye, northern pike, and smallmouth bass fishing until your heart's content. Fed by the Seine River, Calm Lake is a picturesque and productive body of water. Catch and release of larger fish here have continued to make it a spectacular place to return to every year. You can also venture out to find perch and lake trout in nearby lakes. Want a little more adventure to your visit? Consider taking one of their day-trips canoeing. You can venture to the entrance of Quetico Park, or take a guided trip through old canoe routes offering you spectacular views. Or, if you want a simple escape, drive right up to your very own cabin and begin your vacation as soon as you arrive. The sand beach should make that easy for you! Don’t let the name Canoe Canada Outfitters fool you, they are a fully loaded outfitter that focuses on outposts rather than the main lodge. With 14 outposts, two that are drive-in accessible on Nym Lake, there’s no shortage of variety to find the right type of “remote” for you. Batchewaung Cabin, an outpost on its own island can be canoed to combing the canoe tripper and fishing fanatic within you. Choose between custom or expedition packages, whether you want to be fully outfitted or only partially, it’s all up to you. They even have a specific package for us anglers! Kashabowie Outposts are great at helping you choose which one of their outposts is right for you based on your fishing requirements. Smallmouth bass, northern pike and of course, walleye can be caught all over the areas they cover. These fly in trips are sure to bring you memories for a lifetime. After all, when an aerial marks the beginning of your fishing trip, you’re off to a good start. With outposts on ten different lakes, there is a lot to chose from, but don’t worry they’ll help you out. They may have an air base on Eva Lake in Atikokan, but you can travel much, much further north on your fly-in fishing trip if you want to! Sunset watching here has been approved. Niobe Lake Lodge has modern amenities in its drive-in camp but still offers remote fishing opportunities. Don’t let this accessibility trick you into thinking you won’t get away from it all. Niobe Lake is largely off any beaten path, in fact, only a small part of it reaches the highway, everywhere else is wild and quiet. You can visit Niobe Lake Lodge for the entire duration of your trip, or you can use it as a home base while you explore Atikokan a mere 15 minutes away, or the well-known Quetico Provincial Park. Bringing along a canoe can get you into some of the back bays for serene views and unmistakable chorus’ of frogs. Teeming with wildlife, Niobe Lake itself is picturesque, bountiful with fish and easy on the soul. Under two hours from the Fort Frances/International Falls border, this is a great place to go near but feel far. One of the few drive-in lodges east of Atikokan, Crystal Beach Resort is as accessible as it is desirable! Specializing in affordable custom housekeeping plans, the people at Crystal Beach Resort want you to enjoy a fishing vacation for yourself, your friends, or the whole family. If you’re bringing the kids along, they have a beach or docks for jumping and swimming, hiking trails, swing sets and you can even rent a paddleboat. Crystal Lake is home to some very sizeable bass, likely in part to the sizeable pike they need to contend with! Although walleye are not the primary or dominant species in Crystal Lake, they do inhabit their waters. Whether you want to stick around the camp or go exploring other nearby lakes and attractions, Crystal Beach Resort is a great place to hang your fishing cap for a spell.